Air Astana, the Kazakh flag carrier, marked its 16th anniversary with official presentation of its Aviation Technical Center at Astana’s Nursultan Nazarbayev international airport. 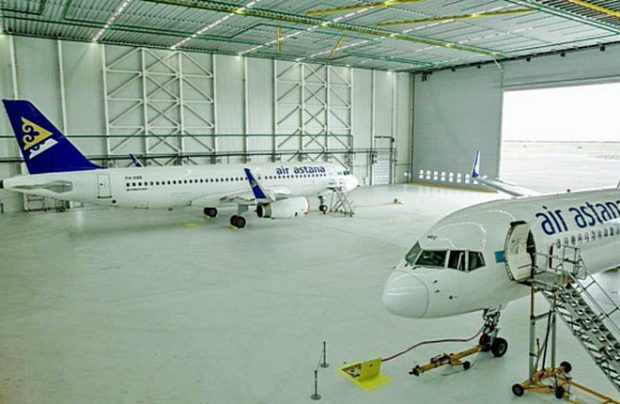 The new aircraft MRO center, opened last year as reported by Russian Aviation Insider in December, enables Air Astana to undertake all aircraft engineering and servicing requirements up to heavy maintenance level. The project was financed by the European Bank for Reconstruction and Development at a cost of US$ 19 million. The MRO center’s single span hangar offers 5,556 square meters of floor space and can accommodate widebody types like the Boeing 787 or Boeing 767, alongside a narrowbody aircraft like the latest Airbus A320neo family simultaneously. The Canadian designed structure is built to a high specification and designed to remain fully operational even under the extremely low temperatures experienced in Astana during winter months. In addition to the hangar, the Aviation Technical Center incorporates a spare parts warehouse and a complete range of workshops for the repair and overhaul of aircraft components. An auxiliary building provides space for the existing Air Astana Engineering and Center to significantly expand training of engineering and maintenance staff to international standards.